This exercise involved no increases in weight, but I was supposed to work on my form, getting lower to the ground, and keeping my body straighter. I definitely felt as though I improved in these regards. Again, this exercise was about form and not increased weight. I did Workout 1 with 10 reps and finished Workout 8 doing 15 reps with much better form. 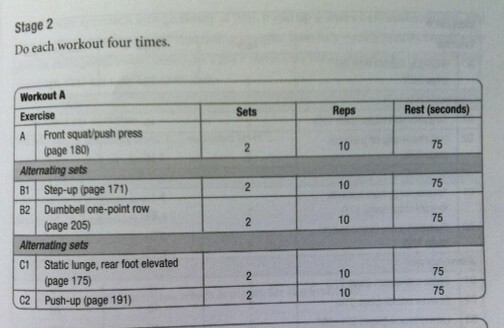 This exercise did not involve weight but progressively difficult variations. 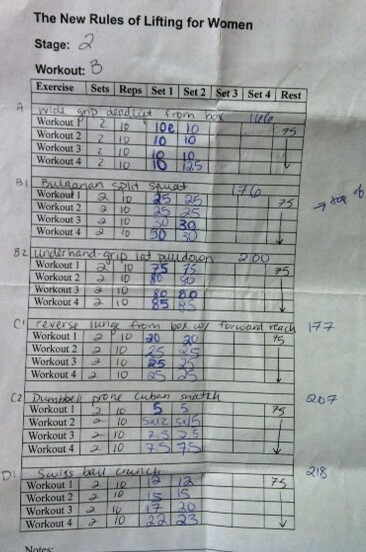 I started Workout 1 doing 15 reps of the easiest variation and ended Workout 8 doing 20 reps of the most difficult one. Overall, I definitely felt that I became stronger during Stage 1. I also became A LOT more comfortable in the weight room and overcame some self-consciousness when using equipment that I don’t generally see women around (barbells, squat racks, weights over 20 pounds…for example). The 6-week Stage did feel a little long, and I was feeling very ready to move onto Stage 2. Onward and upward! I’ve mentioned my weight lifting workouts on a few occasions, and since I know everyone must be dying to get the full scoop…here goes! I learned about the New Rules of Weight Lifting for Women (NROLFW) from Meghann over at Meals and Miles. You can read Meghann’s final review of the program here. Then, there are training log sheets that you can print out online (or copy from the book if you prefer) where you track the weight used for each set and workout within the stage. The book also has a lot of information about nutrition and the importance of protein in our diets (both in general and particularly for someone who is trying to gain muscle). I’ve read more than my fair share of nutrition and diet plans, and they generally seem to all follow the same outline: high emphasis on counting calories and making that count a low number, low emphasis on where those calories come from and proper balance of nutrients. Most diet plans I have read about in either books or magazines suggest somewhere in the range of 1,200-1,500 calories a day, sometimes adding in extra ‘reward’ calories based on exercise. I expected something similar from this book. Thankfully, I was pleasantly surprised! The nutrition and food advice given by NROLFW is a refreshing departure from the standard calorie restriction diets promoted to women in essentially every other ‘nutrition’ plan I have read. The section focusing on food is titled ‘You Aren’t What You Don’t Eat,’ and the author, Lou Schuler, goes on to describe typical diet advice as a fatally flawed “war against food.” One particularly poignant argument that Schuler makes has to do with the number of calories women are generally encouraged to eat on typical diet plans. In a sub-section titled, ‘Calorie Restriction is the Worst Idea Ever,’ Schuler describes an organization called the Calorie Restriction Society. The organization believes that people can live longer, healthier, and better lives by limiting the amount of food they consume. Still, their website has a ‘risk’ section warning against some of the serious dangers associated with cutting calories. Dangers include: depression, loss of strength/muscle mass, deteriorating bone mass, hormonal disruption, diminished energy, infertility, and hunger (duh.). How many calories does the group encourage people to eat? Numbers starting at about 1,400. Yes, the maximum calories [allowed] in the first phase of [the] diet is equal to the fewest calories eaten by members of a cult who try to live longer by teetering on the precipice of starvation. Moral of the story: I am excited to do this plan because the book offers not only a potentially effective lifting plan but also a positive and healthy perspective on food and fitness. Read details of each lifting Stage here!